This site is dedicated to sharing tools that I and others have found helpful in dealing with their brain injury issues. It is specifically designed to “cut to the chase” and give you practical, immediate ideas about how to deal with your (or a loved-one’s) brain injury. Please note, I’m not a doctor, and I don’t have an advanced degree in neuropsychology. But I have been enrolled in the School Of Hard Knocks, and I’ve been dealing with my own multiple TBIs for more than 40 years. So, you might find something that helps you here. I hope so. Below you can find links on background about brain injury (especially TBI), and practical ways you can deal with all the “excitement” that comes from BI. If you have feedback, corrections, or other input to contribute to others’ understanding of brain injury, please let me know in the comments and I will do my best to include it. A brain injury, simply put, is an injury to the brain. It can come from something obvious, like a car accident, when someone smashes their head against the windshield. It can also come from something hidden, like a stroke or a brain embolism or a brain tumor. What can happen as a result? Not meaning to sound like Pollyanna but, in addition to helping MANY others, putting this resource together will do more for your OWN healing than you will believe as you read these words. 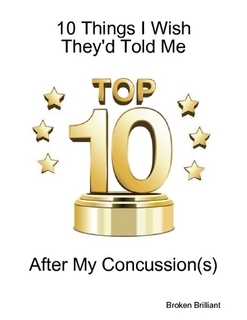 As you implied in “Truly Useful Tools for Brain Injury Recovery” (posted 4/20/13), it is all too easy to focus on loss and everything that’s going wrong – for me too – and that way lies MADNESS, and generally leads to more things going wrong. In my experience, making a difference for others is a way to keep the positive in your “sights.” Whatever will ultimately explain what they now call “the placebo effect,” I am certain that making it a habit to move your mind to something positive when you – me – any of us are inundated with evidence of the opposite, will end up being a key (if not THE key) to health and healing. btw, love your use of “interesting” in your 84 ways, and the posts where you look down the mountain (to see how far you’ve come) as well as UP (to see how far you still must climb). They help me to reframe my own journey, and remind me to do the same. Thanks for writing Leah. These things can take a while to clear up. Sometimes they go away altogether, sometimes they stick around for a while, and sometimes they get stuck and just become a part of the “landscape”. It doesn’t have to be a tragedy or a catastrophe, whatever happens. There are ways to work around it, and there are ways to deal with it all. The main thing is to keep going and keep learning and keep training yourself how to be the person you most want to be. Sometimes it takes a ton of effort and it takes a lot longer than we expected/hope, but it can happen. Leah, I think that you are aware of how “messed up you are” and are already addressing or trying to address these newly found deficits, is very encouraging. For many (myself included), we go on years just with a far away feeling that something is no longer right and all we can see is how others are treating us. New (and that is relative) TBI survivors remind me of the idea of an egg with a chick in it. If the people outside the shell are the ones initiating a change of form of the injured “self”, then the growth process is a mess. But if the chick inside it now knows that something isn’t right in here and slowly gathers the “strength” to get out, then we might be a part of a beautiful new world. Just pay no attention to the onlookers who are looking at the egg and saying come on I’m out here and you have been out here, what are you doing lying in the nest with that shell that you are imagining. If they start playing with the shell, just roll away and know they are the damaged ones. Even the “well-meaning” ones should not get their hands too close to this process if they have a clue on how u r now trapped and in an innocent darkness even if you sense their daylight. There was hope! At about a month, it cleared up slowly. I got my crappy memory back, said good bye to overwhelming fatigue and adios headaches. I still get a little headache here or there but nothing like it was. I am so scared to hit my head now it is sad to be that jumpy. Thanks for the support and hope. Like I said, this was the best website for hope and positive vibes! That’s great news! Thanks for letting us know! Yes, it can be nerve-wracking to think of whacking your head again. Just be safe. I remember one time I slipped and fell on some stairs. I just got jolted a bit and my back got out of alignment. No danger to my head, but I got so freaked out, I thought I’d had a concussion. I called my neuropsych and they talked me down, and boy didn’t I feel silly after that. But all was well, so that’s fine. I’m sure it will be with you too.